Last week I was lucky enough to attend an East African cookery class at Open Kitchen, courtesy of Rainbow Tours. The cuisine of this region has been somewhat neglected relative to other parts of the continent: while I'm sure most of us have tucked in to a Morrocan tagine, or perhaps sampled some South African dishes, far fewer people can boast an intimate knowledge of Tanzanian or Madagascan cookery, so this was a great opportunity to try something a bit out of the ordinary. The evening began with a meet and greet: wine and introductions, accompanied by a delightful assortment of African canapes. Roasted slices of sweet potato and plantain formed the base of many of the titbits - a tasty alternative to the usual melba toasts and rubbery blinis - and toppings ranged from a gorgeous spicy 'peanut butter' with greens to a piquant medley of fish and tomato. Slightly less healthy (but equally delicious) were the deep-fried fish balls - crispy exterior hiding a fluffy centre of mashed potato and salted fish - and the golden batons of battered plantain, piping hot and topped with a tangy tomato salsa. The course began with a demonstration from chef Attoma Mandji, who showed us how to get started on our first dish, romazava vary (or "beef and greens"). This is a traditional Malagasy recipe consisting of onion, garlic, tomatoes, diced beef, beef stock, rice, cabbage greens, and plenty of fresh ginger - the latter playing a major role in transforming the dish from basic stew into something zingy and exotic. With the ingredients prepared, we were ready to begin. I started by frying my diced onion in a glug of olive oil, adding the garlic once the onions had begun to brown (if you add the garlic too early it burns and gives your food an awful acrid flavour, so always leave it until later). Next, I added the diced ginger, followed by two chopped tomatoes, my sliced greens, and a couple of generous ladlefuls of beef broth. At this point I moved my pan to the 'warm' plate (if you're not cooking in a schmancy-pants professional kitchen, simply turn down the heat) and left it to simmer while I returned to the front of the class for another demonstration. The chef now showed us how to prepare our fish, which we would be stuffing with a spicy mix of chopped garlic, chilli and olive oil, and serving alongside a zingy tomato and onion ragout. After stuffing my fish with the chilli, garlic and olive oil mixture, I put it in the oven at 190C to cook for 20 minutes or so. In the meantime, I added a cupful of rice and a few centimetres of water to the stew, and left my ragout to simmer...while I enjoyed what was left of my wine. 20 minutes later, everything was ready. I plated my fish - crisp-skinned and flavoured from the inside by the chilli and garlic marinade - next to an enormous mound of beef and greens. Luckily we were given take-away boxes, and after taking the picture below, I scooped most of the stew into a container: re-heated, it served as a tasty dinner for two the following night! Cooking done, we handed in our aprons and headed downstairs to the restaurant below to taste the fruits (or, rather the fish and stew...) of our labours. The fish was good - flesh moist and flaking beneath the crispy skin - and paired well with the accompanying tomato and onion sauce. However, the romazava vary was the winner for me: a hearty stew of meaty, flavourful rice, it is something I will definitely be making again at home. Cooked in one pot, this is a tasty, fuss-free recipe, with the added benefit of being exotic enough to impress even the most discerning guests. One pot = minimal washing up. Score! 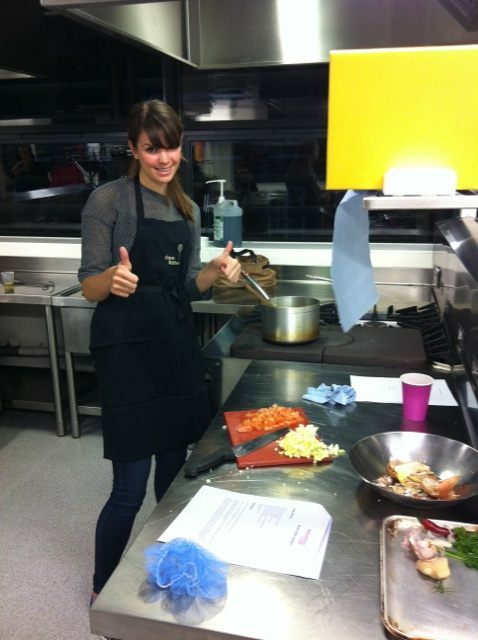 I would definitely recommend Open Kitchen for any budding chefs: they offer a wide range of different classes (from Middle Eastern to Caribbean), and it's a great opportunity to play around in a 'proper kitchen' and to learn how to cook some dishes that might fall outside of your usual repetoire. Or if you're feeling really adventurous, you could always head over to Africa with Rainbow Tours to learn how to cook East African food first-hand!